Oh,… you haven’t heard of Perrin Brewing, you Colorado hipsters? 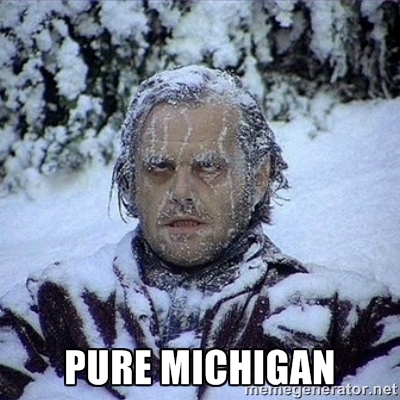 That’s because it’s that Michigander brew… that great mitten state style! Remember, once upon a time, we lived there – have to give credit where credit’s due! And, amazingly enough, Grand Rapids, MI, is a huuuuuge Craft Beer city. Perrin is located about 10 miles north in farming country, but we’ll include it in the Greater Grand Rapids area. I remember when they first opened up a few years ago, and we visited their tap room. Nicely organized, tons of beers on tap, hops garden growing out front, and awesome staff that were all hell bent on you having a good experience. Very cool place! Prrrretty much accurately describes Michigan 9 months out of the year. Happy to be from the state, but just as happy to live in wonderfully sunny Colorado! Perrin Brewing has some amazing flavors to offer, and lucky for us here in Colorado, Oskar Blues Brewery bought the deliciousness and will hopefully be bringing that flavor all the way to Colorado. For a few more words (seriously, not too much more to it), check this article out from our beloved Denver Post. Check out Oskar Blues on Facebook by clicking on this picture. Oskar Blues, 2015. Check out Perrin on Facebook and show ’em some love from afar! Photo Credit: Perrin Brewing Facebook, 2015. We’ll keep our eyes peeled for when Perrin makes its appearance here in the Wild, Wild West. BUT make sure you stop by their site and do your homework. For more on our adventures and what’s good in Denver / the surrounding areas, show us some love! Like us on Facebook. ← REI Dividends? Yes, please. We need legit gear.